Considering adding a large or giant breed dog to your family and need a little help? Download your FREE Do’s and Don’ts Guide for Big Dog Owners today! 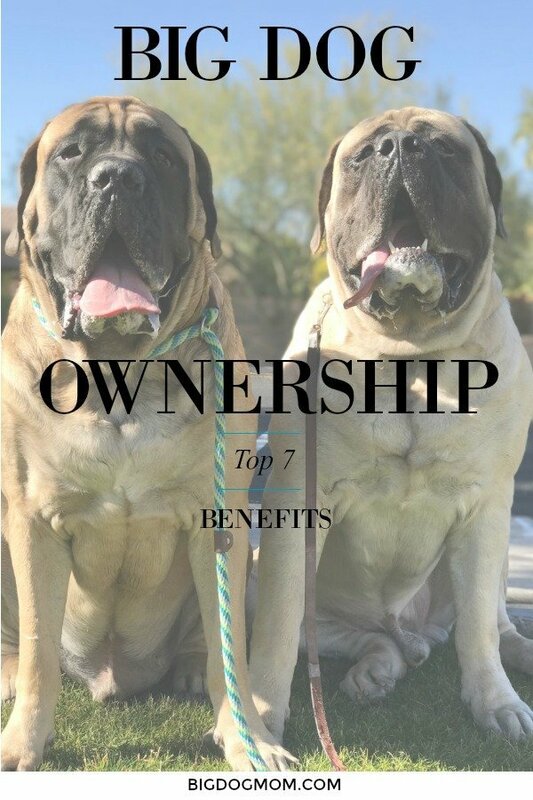 After publishing my Top 7 Reasons Why BIG Dog Ownership Is Not Right for Everyone, I was asked to publish a list on why people SHOULD consider a big dog. I thought about it and came to the conclusion that I am not comfortable selling people on why they SHOULD get a big dog. Frankly, I am more concerned about deterring folks that aren’t the right home for a big dog, than I am convincing someone that they are. That said, there are some aspects of big dog ownership that are unexpected, pleasant surprises, that cause us fanciers to move from thankful to obsessive, raging fans. To illustrate the point further, with my first Mastiff, Maya, I was a big dog lover. A Mastiff fancier. An otherwise normal (sized) young lady with an abnormally large dog. Today, with my third and fourth Mastiffs, Sulley and Junior, I am now known as a Big Dog Mom. A big dog writer incapable of writing anything on the topic of big dogs in less than 1000 words. An otherwise normal (sized) woman absolutely crazy in love with her ginormous dogs, drool and all. A few weeks ago, on a routine walk around our neighborhood, Sulley and I observed a tall, unfit man in a black t-shirt and blue jeans meandering up the street towards my house. He seemed strangely devoid of purpose, walking slowly, yet progressively, down the street, alone. He didn’t seem lost and he carried nothing with him except for his creepiness. Sulley and I followed Creepy Guy at a distance. The man saw us and moved across the street toward the house on the corner. He walked up to our corner neighbor’s house and stood right near their door, but not up to it like he was knocking or ringing the doorbell. He waited there for about 15 seconds while the tiny dogs inside barked and then turned around to head back in the direction he had just come from. Sulley and I continued walking in the general area so I could keep a skeptical eye on Creepy Guy. Once out of sight, Sulley and I went home and I promptly locked all the doors. I have no idea where he was headed or why he was there. I had never seen him before, and fortunately, not again since that day. If there was ever a day that I was relieved to have a big dog at my side, it was that day. In my post, Do You Own A Big Dog Or Want To? Big Dog Mom Can Help!, I briefly addressed my reason for leaving my very successful career to stay home full time with my kids. Because I had a home office and a company car, on my last day of work, a company representative had to come and pick up my car, printer and a few other company-owned items. Keep in mind, Junior was about 13 weeks old at this time. The representative was a middle-aged woman who took her job very seriously and wrote veeeerrrryyy slow. It’s moments like this when you realize who you could be friends with and who you want to grab the pen from and get them out of your house. What should have taken 10 minutes took over an hour, while adorable baby Junior and sweet Sulley watched us longingly from the back door. I joke often that when I take my dogs out in public, they are like rock stars. People flock to them like groupies at a rock concert. Because, of course, I am the one holding the leash and answering the questions about how much they eat and how much they weigh, I am, by extension, a rock star as well. It’s a beautiful thing to not have a single talent to speak of and generate a fan base everywhere I go. Sure they aren’t taking the pictures of me, and, yes, I have been asked to step aside so they can get a better angle of Junior’s head. But, hey, not every job is lollipops and rainbows. When I was in high school I was told by my Home Economics teacher that I should consider going to college to be an actuary. An actu–what, you ask? An actuary. I quickly learned that an actuary is someone who does math all day in order to help organizations manage risk. These are folks with unbeatable analytical skills. What I embraced as a compliment at the time was probably more a criticism of my lack of domestic skills; important activities like sewing, cooking, or carrying an egg around for a week pretending it was a baby (true story). For a chuckle on this last point, read Big Dog Mom’s Most Glaring Weakness Revealed and It Will Surprise You. It all has to do with strengths. 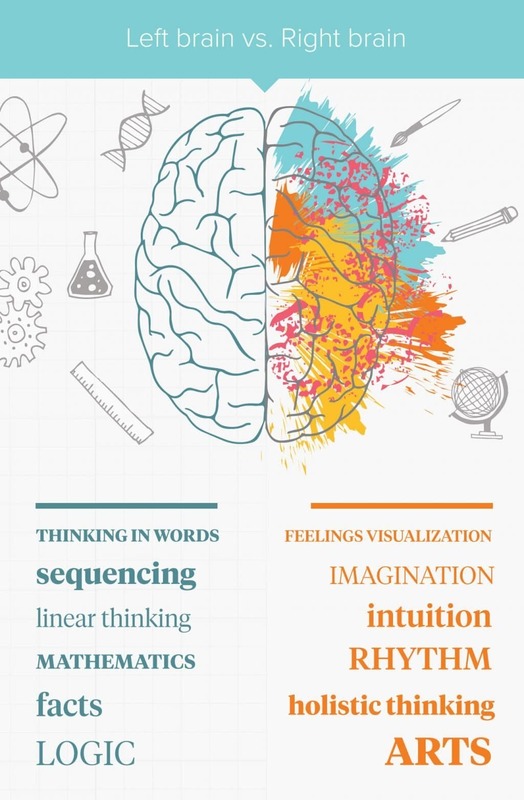 My strengths lie on the left side of my brain. I love writing, analyzing, being on time and logic. The discussion of feelings or emotions causes me to want to curl up in the fetal position. So, what does all of this have to do with big dogs? Big dogs allow you to continually stretch and grow the weaker side of your brain. For me that is definitely the right side. Whether it is forcing me to be patient and take a break on a walk or giving me the opportunity to better understand their feelings and desires, big dogs have a unique power to defy the odds. I am helplessly uncreative, yet, I was able to actualize Big Dog Mom from concept to blog, create unique content and build the early stages of a brand. When I was in middle school, I was teased. I was taller than almost all of the other girls at my school and was painfully self-conscious of my size. While the other girls eventually caught up with the middle school giant (who hit 5’4.5” in middle school then stopped growing), I never quite got rid of that size complex. Unexpected benefit of a very big dog. 6. Big Dog Drool Makes a House Cleaner… Say What? You heard me right. Drool makes a house cleaner and I can prove it. I believe there is a direct relationship between big dog drool and cleanliness. The more drool, the cleaner my house gets. I discussed this issue at great length in How To Make A Great First Impression Big Dog Mom Style. 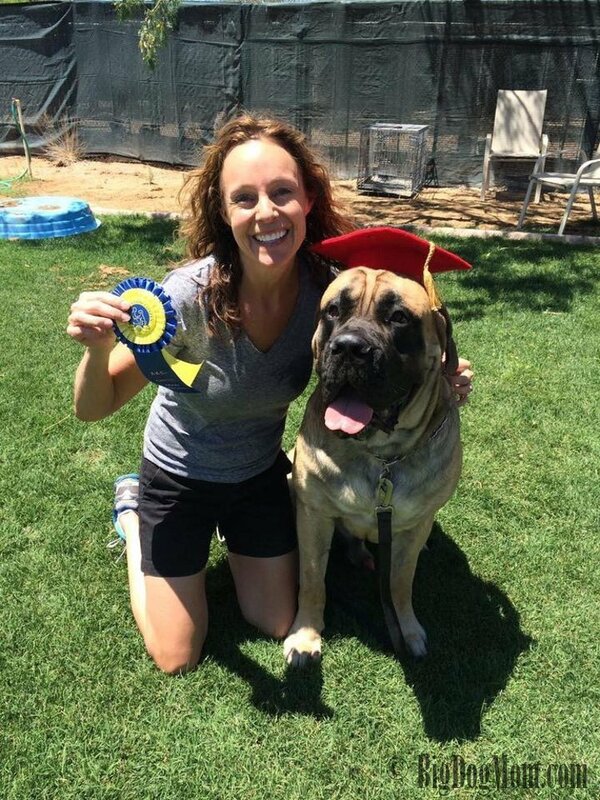 With just one Mastiff, I found myself not overly concerned with wiping dried slobber off walls, sweeping the floors, or laundering drool cloths laying around the house. With two Mastiffs, the drool cleaning is constant. In order to keep the accumulating drool and hair to a minimum, I have to stay on top of it, literally. The actuary in me feels compelled to share this relationship graphically, but I will spare you the nerdy details. With a husband who is a bit of a clean freak, I think I have a pretty strong argument for a third Mastiff, don’t you think? And this is where all of you come in. One of the biggest and most unexpected benefits of big dog ownership has been the community of like-minded, drool crazy friends I have found. According to Strengths Finder, I have zero relationship building skills, and yet Big Dog Mom has grown exponentially since inception. New big dog lovers find this blog and our community every day. Unfortunately for me, this growth is not due to my writing skills or charming personality. It is the power of our big dogs, their virtue, which brings us all together. We are an exclusive group. Many of us have experienced the joy and worry of raising a large breed puppy. Too many of us have experienced the premature loss of a beloved best friend. We are all learning how to better love and care for our big dogs. And we share a love like no other. Big Dog Mom brings us all together. Big dogs make us who we are. Join the Big Dog Mom Community and get your FREE Do’s and Don’ts Guide for Big Dog Owners today! I’m so glad I read this post! I have three Chihuahuas. That’s about as opposite to a big dog as you can get. 🙂 I have to admit that I have always had a big dog phobia. But only because I had never been around them very much. (the fear of the unknown). Then my step-son got Great Danes. Such gentle giants. We moved to Houston for three months and lived next door to a Mastiff named Jackson. He was so gentle and sweet with my two (I only had two then) little munchkins. Then my other son got a Pit Bull. I was definitely afraid of him…. for a while until we got to know each other. Anyway, the moral of this story is I will probably never own a big dog (My passion is Chihuahuas!) but I now love and respect all big dogs. I loved this post. I will steer my two sons to your website. I could not agree more! And I have stressed that on my website. Just like big dogs, Chihuahuas get a bad rap. It’s not the dog, it’s the knowledge of the owner and the time they take to socialize and train them! Phobia might have been too strong a word, let’s say I’ve always been cautious and a little leery. 🙂 Let’s both keep educating our readers for ALL dog’s sakes! You got a deal there, Linda! Well said. Thank you! I LOVE number 5! What a way to look things! 🙂 This is a great post — I love big dogs there is just a level of huggableness that draws me in every time! Oh my, the first photo is so pawsome! I love big dogs. Worked on the political campaign of a local politician and his dog Bear (Mastiff) was the face of the campaign. I can’t tell you what a connector Bear was and everyone remembered the big dog, even if they forgot the candidates name! I love that! Thank you! You got to feel a little bit of what I feel every time I go out in public with my boys. They have a very magnetic presence for sure! People flock to Mr. N as well but more of a tiny fluffy thing that looks like a stuffed animal! I am jealous of the crime deterrent qualities of big dogs though. If I could find a friendly big dog close by, I’d totally offer to walk them with Mr. N as to ward off creepy people (and unfriendly dogs!). I can totally understand. You know, one of the reasons I mentioned the little dogs in the house where the creepy guy went is that it often doesn’t matter the size of the dog. Any bark can act as a deterrent. Big dogs definitely have an advantage though when out and about on walks. And yes, I don’t worry too much about other dogs. Both of my dogs have been attacked, Sulley by several very small dogs and a Samoyed, and Junior by a couple small dogs. I’m lucky that Sulley and Junior are the opposite of reactive and pretty much ignore bad behavior of other dogs. They look at them quizzically which is about it. It was always really funny with Jehova’s witnesses. They would show up at the door and Roxy (at that time) would stick her head in the door to see what’s up. They were gone just like that. I am envious of your big dog security force. To anyone knocking on our door, Bernie can sound like a larger dog, but out in public that jig is up. Your point about strengthening the other side of your brain makes so much sense to me. I’ve never considered myself terribly creative, but I am methodical. After I learn a process, I’m usually comfortable varying up elements. I’ll experiment, so sometimes I’ll stumble into a creative concept that I like. Blogging has so many process-oriented tasks that I like playing with pieces of writing or pictures/graphics and seeing what I can create. And you’re right. It’s all about practice. I just keep plugging away and over time the creative process does seem to get easier. Thank you, Irene! The funny thing is that when people meet Sulley and Junior, the jig is up with them too. They are too friendly for my own good. From a distance though, they are very intimidating. I love that! You and I are so much alike in the creativity department. Once I’ve mastered something from a process or logistical point of view, I am comfortable playing with it. Creativity is not something that comes natural though… I really have to set out and deliberately think to myself “ok, now, try a color other than black, gray or builder beige… just try it, it’ll be ok.” Haha! There are a lot of benefits of having a big dog, including rock star status! Good luck with your quest to get a third Mastiff! Thank you, Ruth! I have only taken Junior to the dog park once just a couple weeks ago. I got the sense there were lots of folks there who admire Junior, but could never get one like him. A totally brilliant post and I hope this is a help for anyone who doesn’t think their big dog is making an impact!! Well done and I love the pictures and layout!! As a man who shares his life with 4 large dogs, albeit not quite as large as yours, I agree with all of these points! And the drool is the absolute BEST! I’ve always been a “big dog” guy and, despite the silly reactions from passersby as well as the education we undertake as big dog pet parents, I will ALWAYS be a big dog guy! I love your comments about big dog drool helps keep your house cleaner and I imagine that is very true! I grew up with a collie and I loved him. I’ve been owned by cats for the last 40 years, though. Haha! Thank you! I bet your house is so clean! Not only is your house drool-free, the cats clean themselves too! It was fun to read about the big dog side of things. Never having had a big dog it is interesting information. Love the photos too! So many good reasons to have big dogs. We have downsized so have our first small dog together- Kilo the pug- I am loving him as he is such an affectionate little lap dog but my husband still prefers bigger breeds like labs. Congrats on your brand and good work on the blog. Thank you so much! I have always said Pugs are like big dogs in a little package. I could totally see myself getting a pug or a frenchie one day. Just love them! Oh I love this clever post. I enjoyed reading about aspects that I normally would never think about especially like crime deterent while out walking with your dog or a cleaner home because of them. LOL Love all your points. I’m a more of a cat person but the whole “Screening” process, I’m with ya! If the furkids are weary, I’m weary of you too! LOL I totally get it when some folks say ” I don’t trust a person who doesn’t like animals”. Thank you so much, Kamira! There’s a lot to be said for the intuition of dogs (or cats for that matter). They often sense what we can’t and I’ve learned to pay attention to that. These are such great pluses of being a big dog owner! I was laughing at that lady who refused to meet your puppy. My husband worked in insurance and visited homes and body shops frequently, he said I wouldn’t believe all the insurance guys that got bitten by “nice dogs”. There must be something about insurance adjusters that sets them off…..LOL!! Hahaha! Perhaps you are right… but a PUPPY?! I still say that lady was a weirdie through and through!